Worthwhile Places is a fascinating inside look at the history of some of our most treasured national parks. 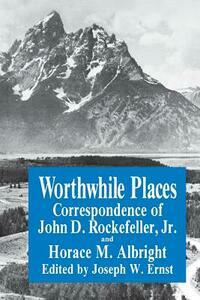 The book illuminates a remarkable public-private partnership that helped to shape our national park system. The close association and warm and lasting friendship between John D. Rockefeller, Jr. and Horace M. Albright is documented through 211 letters covering a 36-year period. The letters portray a common concern for and love of our nation's natural heritage and efforts which preserved countless scenic wonders for future generations. Horace Albright joined the National Park Service at its inception in 1916. He was superintendent of Yellowstone National Park and later director of the National Park Service. After he left government service, he remained active in the conservation movement until his death in 1987. John D. Rockefeller, Jr., a generous supporter of the national park system and other conservation and preservation activities, was one of the earliest proponents of private sector cooperation with the national government's preservation efforts. The letters provide insights into the plannings and problem solving which led to the creation of Acadia, Grand Teton, Grand Smoky Mountains, and Virgin Islands national parks as well as other conservation/preservation efforts for the California Big Trees, Florida's Bald Cypress Swamp, and Colonial Williamsburg. Dr. Joseph Ernst's Overview and Epilogue place the letters in their historical perspective and provide glimpses into the lives of John D. Rockefeller, Jr. and Horace M. Albright. This selection of letters highlights the sweep of their vision for America's outdoors, which literally stretched from coast to coast.